The Panorama/BBC Arabic programme on Syria purports to be based on serious research but the research is disgracefully shoddy and biased. The programme is an unadulterated transparent piece of propaganda, not surprisingly given the UK government funding of BBC Arabic and the staffing of that station with Syrian opposition sympathisers. The reports were from a variety of sources considered broadly impartial and not involved in the fighting. They included international bodies, human rights groups, medical organisations and think tanks. In line with investigations carried out by the UN and the OPCW, BBC researchers, with the help of several independent analysts, reviewed the open source data available for each of the reported attacks, including victim and witness testimonies, photographs and videos. The BBC team had their methodology checked by specialist researchers and experts. If this is so, why is the BBC so coy about revealing the names of these ‘broadly impartial’ sources, ‘independent analysts’ and ‘specialist researchers’? Could it be because they include controversial groups such as the White Helmets, convincingly accused of being jihadi collaborators and of faking incidents, and the openly propagandistic US-based Syrian American Medical Society, or the pro-jihadi also US-based Union of Medical Care and Relief Organisations? And do those ‘think tanks’ include Chatham House, cited in the report, which is notorious in the research community for giving perches to pro-opposition Syrians? We challenge the BBC to set against each alleged incident the sources of information, and then all can make a judgement of how impartial those sources are and how reliable the findings. This should not be difficult. The results of the analysis of the prioritised samples submitted to OPCW designated laboratories were received by the FFM team on 22 May 2018. No organophosphorus nerve agents or their degradation products were detected, either in the environmental samples or in plasma samples from the alleged casualties. Various chlorinated organic chemicals were found in samples from Locations 2 and 4, along with residues of explosive. These results are reported in Annex 3. Work by the team to establish the significance of these results is ongoing. The FFM had full access to other areas of interest within the same building, namely the balcony where the cylinder had allegedly impacted, the apartment directly below this, and the basement of the same apartment block. 8.13 The team deployed to Location 4 (N 33° 34’ 24”, E 36° 23’ 41.1”) on 25 April 2018. The team gathered a broad selection of sample types, took videos, photos, detection measurements, and relevant dimensions of the location and the cylinder. 8.14 Work is in progress regarding the location of the cylinder, its provenance, and the damage to the reinforced concrete roof terrace and the cylinder. It is planned that a comprehensive analysis will be conducted by suitable experts, possibly in metallurgy and structural or mechanical engineering, to provide an assessment of how the cylinders arrived at its location, in addition to the observed damage to the bed and other furniture of the room, the roof, and the cylinder itself. In other words, they found no evidence of the use of prohibited weapons and in the case of the chlorine canisters they could not rule out that they may have been brought in and placed (‘provenance’) so as to deceive. There are many other examples of selective omission, too numerous to catalogue. One further example, however: many military experts have questioned the usefulness of chemical weapons on a battlefield. Why is their testimony omitted? 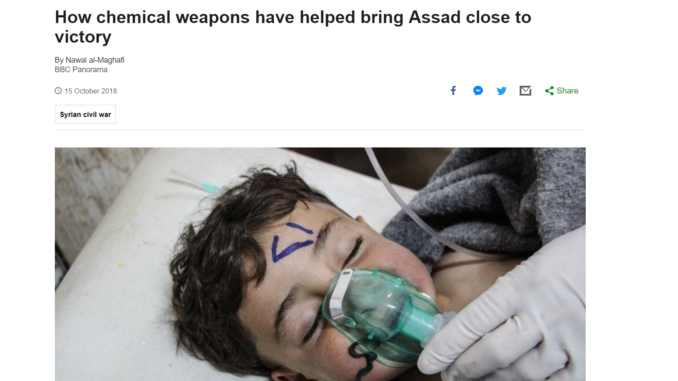 And why would government forces need to use chemical weapons of limited usefulness, giving the Western powers transparently looking for excuses to bomb Syria a pretext to do so, when it could achieve the same ends by using the fabled ‘barrel bombs’? Panorama never learns, but the public does.